North Andover, Mass. – A handful of Major League scouts made the pilgrimage to Grogan's Field Tuesday afternoon to catch a glimpse of Central Catholic ace Steve Hajjar. It was Hajjar’s counterpart who stole the show. 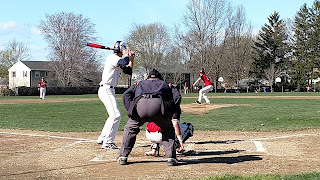 North Andover senior pitcher Anthony Sapienza out-dueled Hajjar throughout the warm afternoon to lead the Scarlet Knights to a 2-0 win over No. 2 Central Catholic in a Merrimack Valley Conference battle. Sapienza, bound for Roger Williams University next year, held the Raiders in check during his six innings of work. The right-hander allowed just three hits, walked three and struck out eight. With the win, North Andover improves to 6-1 while Central Catholic falls to 7-2. The Scarlet Knights plated solo runs in the third and sixth innings and let Sapienza do the rest. Using a solid mix of four-seam and two-seam fastballs, parlayed with a nasty slider and curve, Sapienza kept the mighty Raiders bats relatively silent. "I kept trying to get them off-balanced," said Sapienza. "Then I tried to work away and let my defense do the work. Myself and Steve have always been brothers and have played together since we were little. So it was definitely nice to go head-to-head against him. The adrenaline was certainly running today for me and it was fun." Hajjar, committed to the University of Michigan next year, was equally forceful on the mound in this classic pitcher's duel. The lefty was consistently throwing in the low 90s and also went six frames, surrendering five hits, walking none and fanning four. 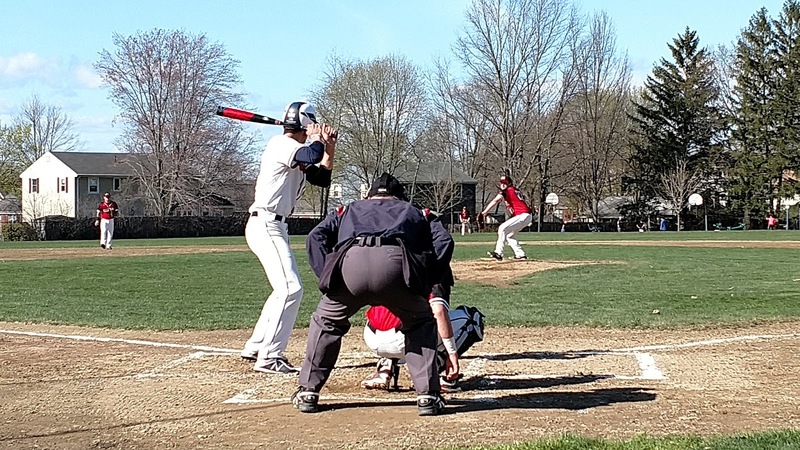 North Andover's approach at the plate was to remain aggressive but also wait out Hajjar by looking for that rare opportunity to swing at balls over the plate. The Scarlet Knights tallied a run in their half of the third. Derek Finn led off by laying down a bunt single and moved to second following a wild pitch. Moments later, Finn came around to score on Joe Quinlan's opposite field single to right. Meanwhile, Sapienza cruised through his first four innings. But in the Central Catholic fifth, things got a bit interesting. Hajjar reached on an error. Two outs later, Mike Pierro grounded a single to right field putting runners on first and second. Sapienza, however, spun in one of his top breaking balls of the day to generate a strikeout and escape trouble. "When (Anthony) has his good stuff working for him he is pretty-much un-hittable,'' North Andover coach Todd Dulin said. "He locates his pitches well. I think he helps out the defense because he works so quick to the plate. He told me today that he wanted the ball so we gave it to him. He has always been a great competitor going back to his sophomore year. He has been awesome for us." North Andover added insurance in the sixth. Jake McElroy opened with a single. Moments later, Sebastian Keane, headed to Northeastern University next fall, ripped a 3-1 high fastball to left for a double plating McElroy with the Scarlet Knights' second run. "Our approach early in the year hasn't been so great," said Dulin. "We have been working really hard on keeping things simple. We are very young. We have two seniors but beyond that the rest of the team is made up of sophomores and juniors. We had some growing pains early but hopefully now they are starting to put it all together." Designated as the home team due to the fact that they do not have a home field this season, the Raiders put forth their biggest threat in the bottom of inning. Perhaps a bit fatigued, Sapienza (92 pitches total) set down the first two Central Catholic batters but then issued a pair of walks, sandwiched around a Dominic Keegan single, loading the bases. Realizing a solid hit would most-likely tie the game, Sapienza settled down by striking out Patrick Casserly to defuse the threat. "I knew I needed to throw strikes after walking two at that moment," Sapienza said. Keane was brought in for the final frame. After allowing a lead off single, the hard-throwing right-hander proceeded to strikeout the side to the save. "We tip our hat to both Sapienza and Keane," said Central Catholic coach Marc Pelletier. "They are both talented kids. They had a couple of clutch hits today but we had the bases loaded late with an opportunity to drive in a couple of runs but we couldn't get that hit. Steve's effort is always going to be there. He throws strikes and keeps you in games. Nobody is criticizing his effort today. He gave us everything he could."